Cooper's Hawks - Raptor Rehabilitation of Kentucky, Inc. Among the bird world’s most skillful fliers, Cooper’s Hawks are common woodland hawks that tear through cluttered tree canopies in high speed pursuit of other birds. With their smaller lookalike, the Sharp-shinned Hawk, Cooper’s Hawks make for famously tricky identifications. Both species are sometimes unwanted guests at bird feeders, looking for an easy meal. A Cooper's Hawk captures a bird with its feet and kills it by repeated squeezing. Falcons tend to kill their prey by biting it, but Cooper’s Hawks hold their catch away from the body until it dies. Their long slender toes allow them to reach through the feathers of their prey to grab the meat of the bird, preventing an escape of their meal. They’ve even been known to drown their prey, holding a bird underwater until it stopped moving. 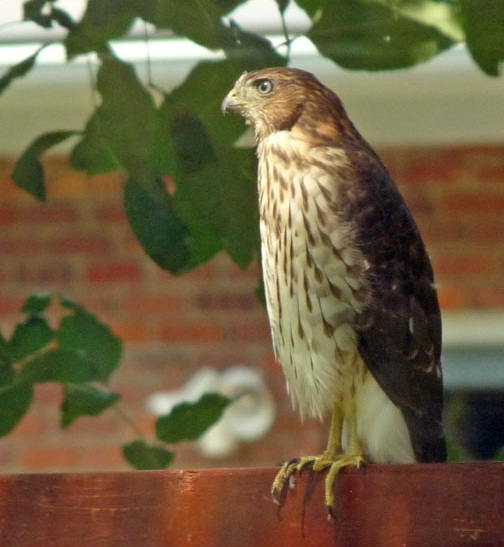 Once thought averse to towns and cities, Cooper’s Hawks are now fairly common urban and suburban birds. Some studies show their numbers are actually higher in towns than in their natural habitat, forests. Cooper’s Hawks show the classic accipiter flight style: a few stiff wingbeats followed by short glides. But in pursuit of prey their flight becomes powerful, quick, and very agile, allowing the bird to thread its way through tree branches at top speed. Life is tricky for male Cooper’s Hawks. As in most hawks, males are significantly smaller than their mates. 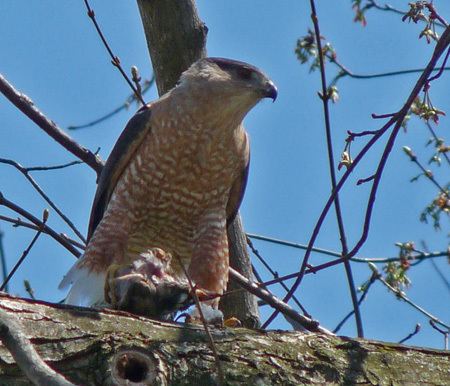 The danger is that female Cooper’s Hawks specialize in eating medium-sized birds. Males tend to be submissive to females and to listen for reassuring call notes the females make when they’re willing to be approached. Males build the nest, then provide nearly all the food to females and young over the next 90 days before the young fledge. Courting birds display by flying with slow wingbeats, then gliding with wings held in a V. Males make a bowing display to females after pairing and before beginning to build the nest. You can tell the age of a Cooper's Hawk by the color of its eyes. A first-year bird had grey eyes. During its second year, the eyes turn yellow, and when it is sexually mature, the eyes are red. 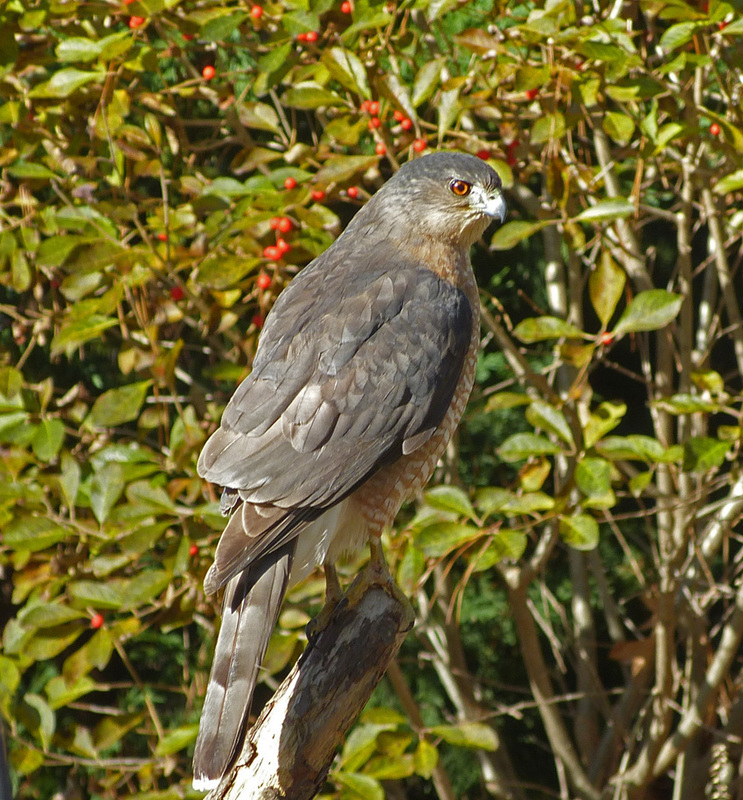 Cooper's Hawks are recognizable by the long tail when they fly. The white feathers under their tail are sometimes mistaken for a white rump patch, such as Northern Harriers have. Cooper's Hawks are high energy birds, and do not adjust well to captivity, so we do not have one as an education bird.